It was a tempting sight for struggling landscaper Eli Estrada: a bag filled with $140,000 on a Cerritos street. There was his credit card debt, upcoming wedding and making ends meet with his artificial grass and landscaping business. But turning it over to Long Beach police last month was the right thing to do, he said. The 40-year-old Estrada admits that some days "I think I was nuts," but he adds, "I know in my gut that to keep that money would be wrong." The Bank of America money bag was lost March 11 by Brinks Armored truck drivers. 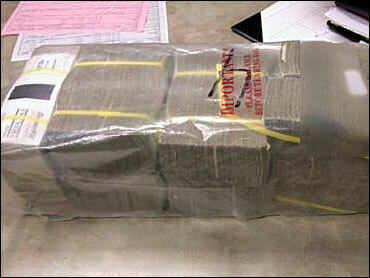 The unmarked $20 bills were bundled into wads of $20,000 and bound for ATMs. Long Beach police Sgt. Dina Zapalski said Estrada handed over the money bag to an officer who took a report at one of the landscaper's job sites. Zapalski said she had never heard of someone turning in so much cash. "I've had people come to me with purses and wallets with cash in it and they'll turn it in," Zapalski told the Los Angeles Times. "But not like this." Brinks later gave him a $2,000 reward. "They should have given him 10 percent," Estrada's mother told the Times.